Teachers are amazing, they are people who put their time and heart on the line to care for other people’s children. They make a difference in the future. I’m not just saying this because I am a teacher myself, or because some of my best friends are teachers, but because it is the truth. Teachers rock. With only 24 more days of school to this school year I know you are all looking for ideas on how to appreciate those special folks who have spent all that time educating your children. This post is for you. Bake cake according to directions on the box. Bake in a 13X9 pan and cool completely. Prepare and chill vanilla pudding. Dice strawberries and get all ingredients out and ready to assemble. One of the best tricks I have learned over the years of delivering baked goods to people is that a clear 9 ounce plastic cup will fit into a cellophane treat bag (4″ X 9.5″). You can tie it with decorative ribbon or a gift tag and it makes a great presentation. Begin by layering the strawberries in the bottom of the cups. Remove your cake from the pan and slice it lengthwise as if you were making a layer cake. Place a layer of the cake on top of the strawberries. Press cake down gently with you hand to make a level layer. Next layers the pudding mixture followed by a layer of cool whip. I placed my cool whip and pudding into piping bags so that it was easier to get into the cups. 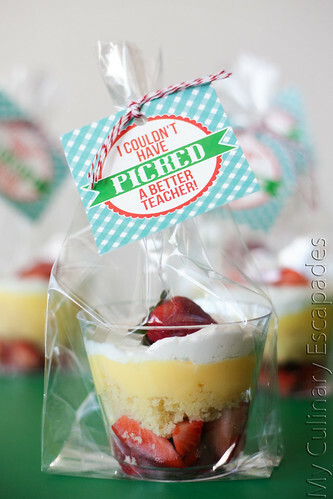 I topped each “cup” cake with a strawberry or several diced strawberry pieces. Gently slip each cup down into the bag and tie shut. Then head on over to eighteen25 and print some of her adorable gift tags. (I print my tags on Brother HL4150CDNmy with white card stock.) And because I am IN LOVE with twine at the moment I tied each one closed using several strings of twine. 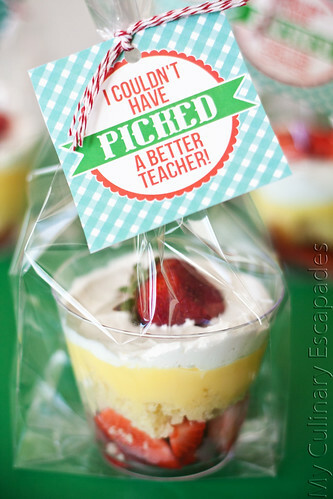 You can make a batch of these up really quickly for all those important teachers in your life. Heck, with those printables you could make them for anyone you appreciate. Whatever you do, don’t forget to make an extra one to stick in the back of the fridge just for you.